On Tuesday morning we took the train to Florence. Hilariously our first train ride would be the only one that was flawless. After 4 hours we arrived at our destination. Alana had smartly printed out walking directions from each train station we would be in over the week to the hotel. 3/4 were all within about 6 minutes of the train stations. Our affittacamere (landlady) Vanessa was incredibly nice. We paid our city tax (1 euro/person/day, no idea how they decide which city deserves more money) and we went to see David. We hadn’t bought skip-the-line tickets and we didn’t like the size of the line forming so we flagged down people who sell skip-the-line tickets in front of venues and bought from them. We were in within minutes. Again, can’t stress this enough, buy ahead, it’s worth the few extra euros and the time saved. David is massive. I thought he was going to be around 10 feet tall, maybe. But he’s huge. 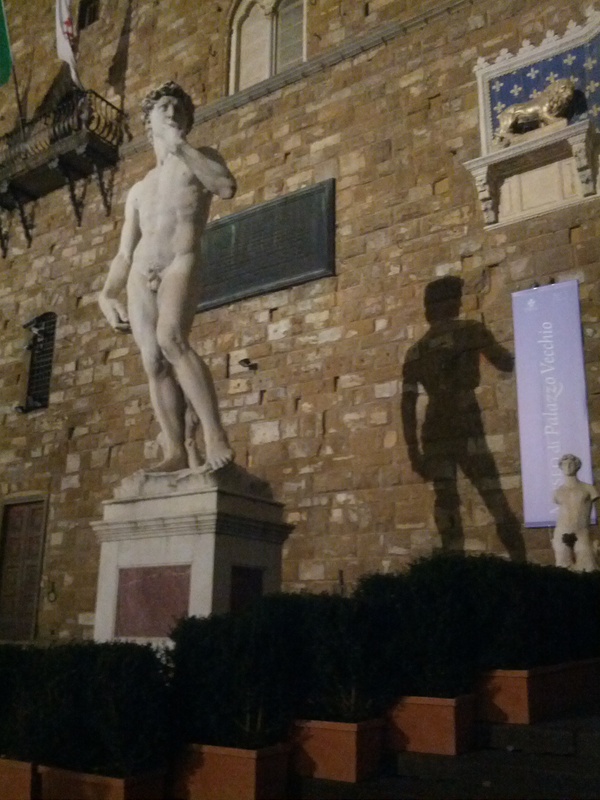 You can’t take pictures inside the museum so they installed a replica where David once stood in Florence before they moved him inside. We accidentally found the open air museum where the replica stands on our first night in Florence. The open air museum is really awesome. So many statues, all for free. 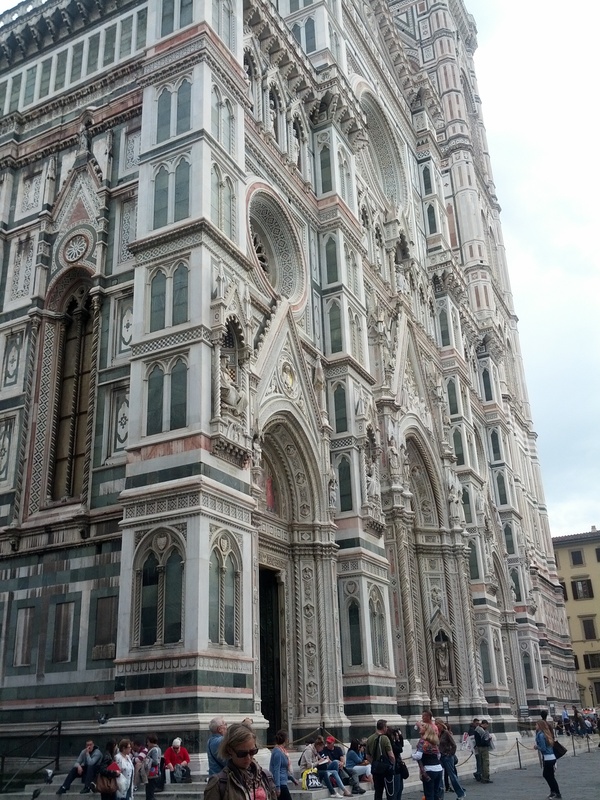 After seeing David we walked towards the best thing in the entire world: the Florence Cathedral. We basically stood around staring at it for hours over the next few days. You get to hang out around, on top, inside this Cathedral in an Assassin’s Creed game. We all took a ton of pictures but without being there you can’t tell how impressive the marble colouring and the size really is. It would take like 10 minutes to walk around the entire building. Florence doesn’t seem as big as Rome, but I liked it better. It’s pretty flat, and easy to walk around. Except for the side-walks, which don’t exist. You basically have to walk on the road or on the side-walk blocked by cars and vespas. Those are your choices. We found a 99 cent store and bought snacks. Then we went out to dinner. We ate at La Prosciutteria. It was delicious. 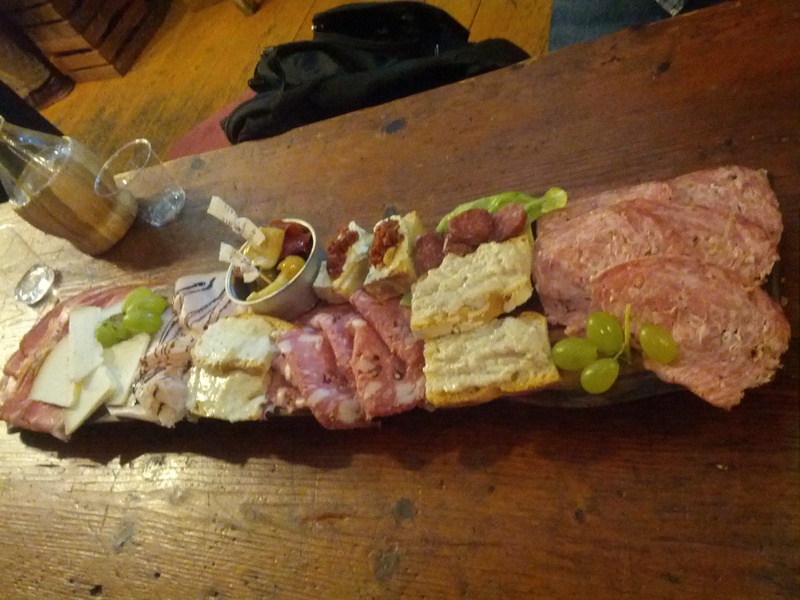 For 20 euro they bring you a giant tray of meat, cheese, olives and bread. And you get free water. You basically can only get free water from the sides of buildings or troughs or monuments in Italy, you can’t get it from restaurants, so this was a huge deal. We scarfed the tray down so fast. I’d definitely go back here when I get the chance, the meat is nothing like our meat. After dinner we walked around and ended up at a gelato place. We had tried 2 other gelato places in Rome but neither were very good. Our third try resulted in the best gelato I’ve ever eaten. Coronas Cafe has so many kinds of gelato and I bet they’re all great. We went back here the second night. I kept having lemon and strawberry mousse. I’m sad I don’t have any right now. I don’t think any of us got evidence of the gelato because we were so busy freaking out about how good it is. 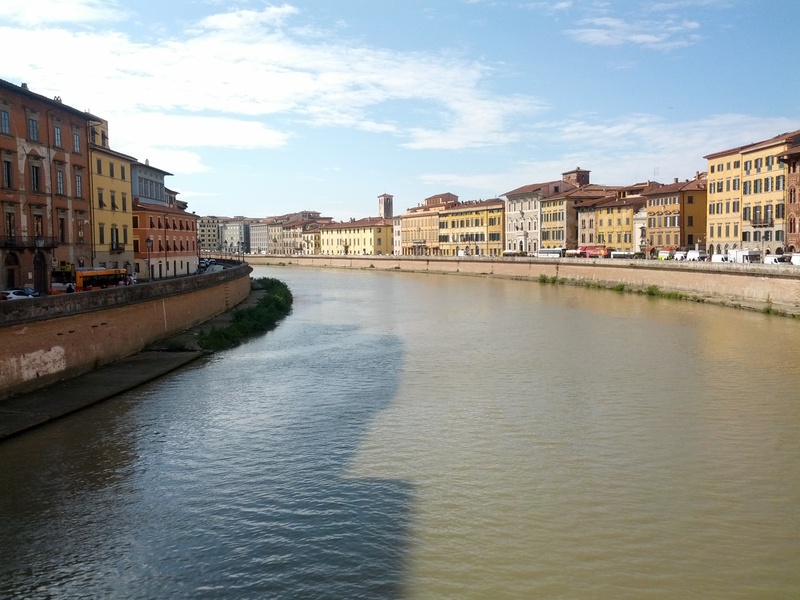 The next day we took a train to Pisa. This was the first train mistake we did but not the last. We sat in what we thought was the Pisa train for around 50 minutes before getting off to check. Turns out we were on the right train but we could have been on a more right train 1 platform over which left every 30 minutes. 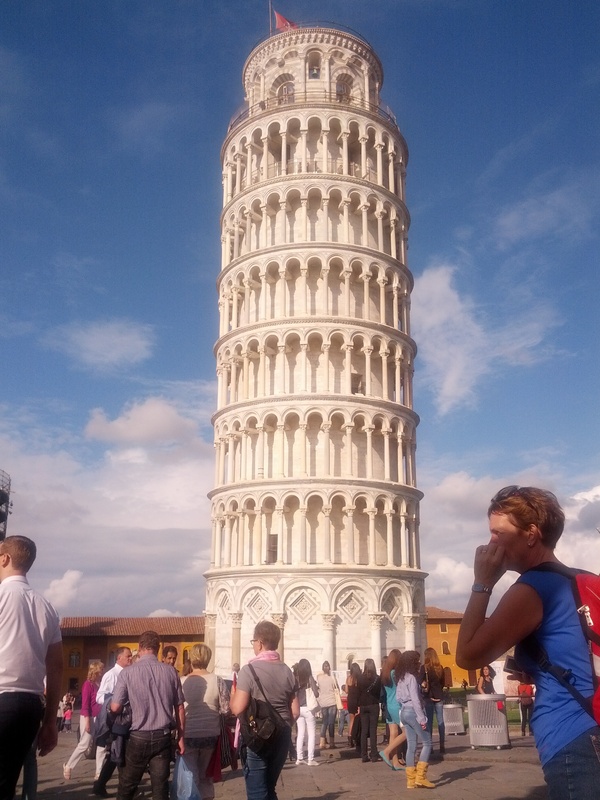 Eventually we made it to Pisa, it’s a fast train ride from Florence, I recommend you do a 1/2 day trip yourself. We almost booked a tour, that would have been a mistake. After arguing for 20 minutes about how to take a holding up the leaning tower shot we finally followed Alana onto the grass. This started a mass grass-odus. Every one who hadn’t wanted to go onto the grass because there was a sign that said Don’t Go On The Grass followed us. We snapped our pics and ran away. Pisa is a beautiful little town, it’s easy to walk around, and their side-walks look way more legit than other they do in other towns. We even found a really nice hotel to go to the bathroom in. That was maybe my favourite part of Pisa. After we trained back we went to dinner. We ended up at Trattoria il Contadino. It’s a set menu. For $13 euro you get wine, water, and 3 courses. It’s hard to find but it’s worth it. The price is great and the food is great. I had rabbit. Dave ate the whole second rabbit. They gave me 2 rabbits! After dinner we walked over to the Ponte Vecchio. Next time we visit Florence I definitely want to visit the bridge during the day. It has lots of shops all along it that weren’t open by the time we got there. After hanging out on the bridge we went back for gelato (duh). The only thing we all really wanted to do in Florence that we didn’t get to was Villa di Pratolino. Apparently it’s only open some weekends throughout the summer and we were there in October on a Wednesday. It’s a bummer but we’ll definitely be going back to Florence at some point so we’ll make sure to see it then. We all really liked Florence. Florence at night in particular. I’m not sure where tourists are going that they feel nervous or like they’re going to get robbed but I never felt like that. I liked that Pisa was so close and that trains ran so frequently. I liked that you could walk around and see so many indulgent buildings. Florence was super rich at some point and they sure know how to show it. I’d like to start in Florence next time we want to go to Italy and work north from there. I just need to learn how to deal with train mess-ups better (more on that in Venice). Next up: part Venice. So many bridges. According to my Fitbit Dave, Alana and I walked over 180,000 steps while we were in Italy last week. We walked around 80 miles. We all fit into our clothes better than when we had started. A weeks worth of serious walking (and climbing) was gruelling on our feet, legs and Alana’s back but it was worth it. We got to Rome at around 2 pm and found our way to our B&B. While on our way there I accidentally clocked a nun with a forearm shiver. It was a good way to start our vacation. It’s hard not to clock nuns in Rome, it turns out, they are quite literally everywhere. No one was there to check us in, or let us into the building. We laughed. Italy’s B&B’s, as we quickly found out, are mostly in really old apartment-style buildings that have been converted into hotel spaces. We stayed at the B&B Maggiore for the first 3 nights we were in Italy. I’d recommend it because you can walk to the Termini within minutes and it’s very close to the Colosseum and Trevi Fountain. It also has private bath rooms and you’re allowed to flush toilet paper down the toilets. You might laugh at that but trust me, it matters. We plugged at least 3 toilets around Italy because we wanted so desperately to not put toilet paper in a garbage can. 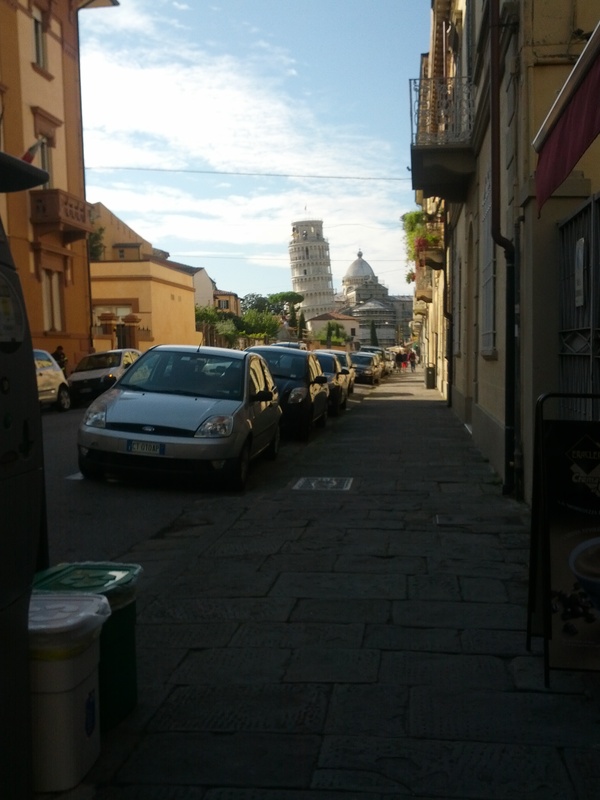 After the manager of the B&B ran over to meet us, we paid our city tax (2 euro a day/person in Rome), left our stuff in our room and ran away to check out our new neighbourhood. 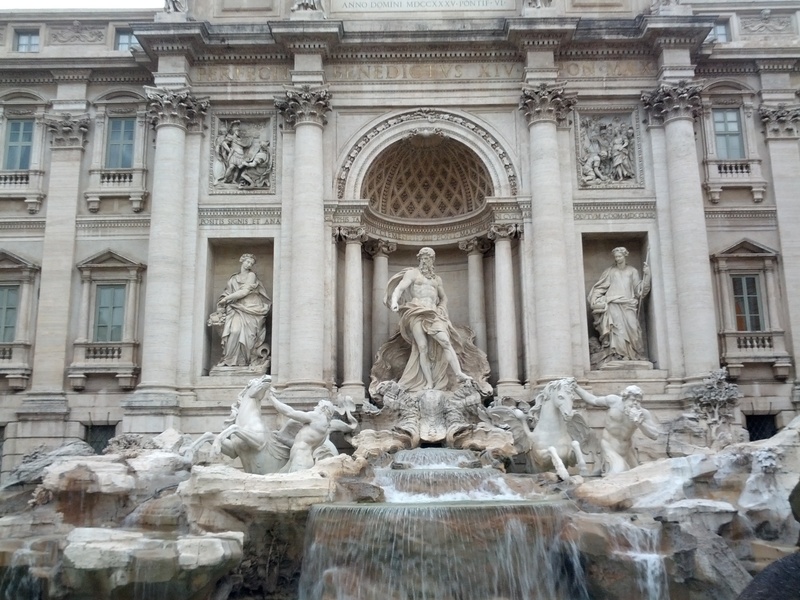 The first thing we went to see after eating and being awake for around 24 hours was the Trevi Fountain. It was packed. Beautiful. But packed. I don’t even want to imagine what it would have been like on a really hot day in August when even more tourists are visiting. It’s very impressive, in fact everything in Italy is very impressive. You basically run into another really amazing building/site/relic every 15 feet. We spent a lot of time wandering around on the first night and then headed back to our hotel. When we got up on Sunday we headed to the Colosseum. Alana and I had already booked our tickets online a few weeks prior. I recommend this to anyone going to see any major tourist site. We were able to skip the massive line and walk right into the Colosseum within minutes of arriving and all we had to do was pay an extra few euro each for booking online. I hate waiting, I’m a terrible waiter, (more on that later) so it was worth it. The Colosseum was smaller than we expected but very, very cool. We wandered around, trying to escape accidentally being stuck behind tour groups (there are hundreds everywhere you go) and explored the Colosseum for about 2 hours. 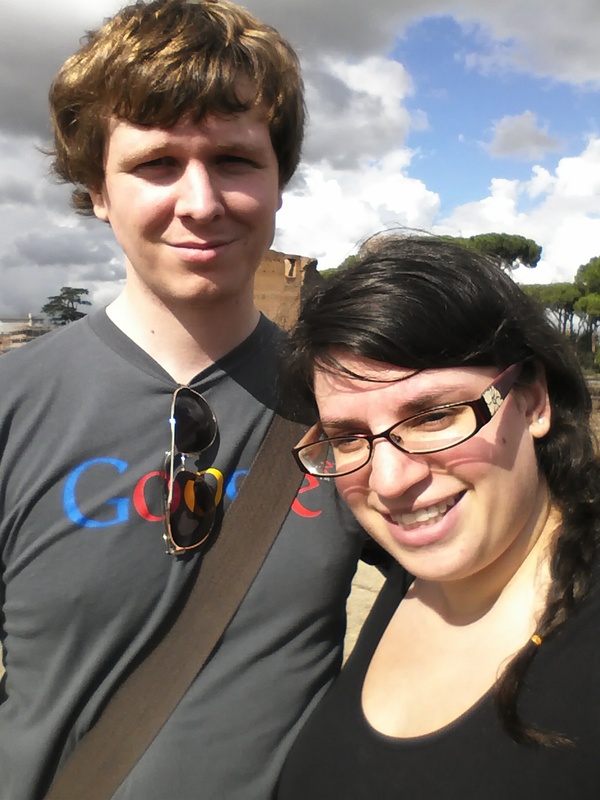 Afterwards we headed to Palatine Hill. It was far less crowded, mostly because I don’t think people realize when you buy a ticket for one, you get to visit the other. So my other piece of advice is if you haven’t bought a ticket online, go buy one at the Palatine Hill entrance which is a much, much shorter wait and then go visit the Colosseum, skipping the line. (I’m not sure how people who can’t Google get anything accomplished in other cities.) Palatine Hill is really awesome. I liked it better than the Colosseum. It’s vast and you can wander wherever you like. It also has some really great views of Rome. After the Colosseum and Palatine Hill we walked over to find the cat sanctuary. You can’t go inside the ruins where the cats live but you can walk around it and check out the area where they are cared for. There were so many cats that all looked pretty excited to be living in the coolest place a cat could live. Alana took a lot of pictures of the cats, basically every cat we could find got its picture taken. She also turned so hard into a woman to see a dog that she dropped her shoulder and annihilated the lady. Basically we went around Rome attacking people. We also watched this busker make 5 of these really awesome spray paintings, I couldn’t get over her. On Monday we took the most packed, sweatiest metro ride to the Vatican. Again we had bought tickets ahead of time, arrived just before 9 am and waltzed past the biggest line I’ve ever seen. It wrapped the entire way around the Vatican, basically. And it wasn’t even 9 am. We sorta snuck in with a tour group, unbeknownst to us, and walked past 10000 tapestries to hang out in the Sistine Chapel. Amazing. It’s very small but incredibly detailed. That should be Rome’s motto “We’re VERY Detail Oriented”. You can’t take pictures in the Chapel, but it wouldn’t have mattered, you can’t tell how the paintings look like they’re climbing off the wall at you unless you’ve been there anyway. Go right away at 9 am, beat most of the crowd, have a seat and look at all the work that would have went into painting that many frescos in such a short period of time. 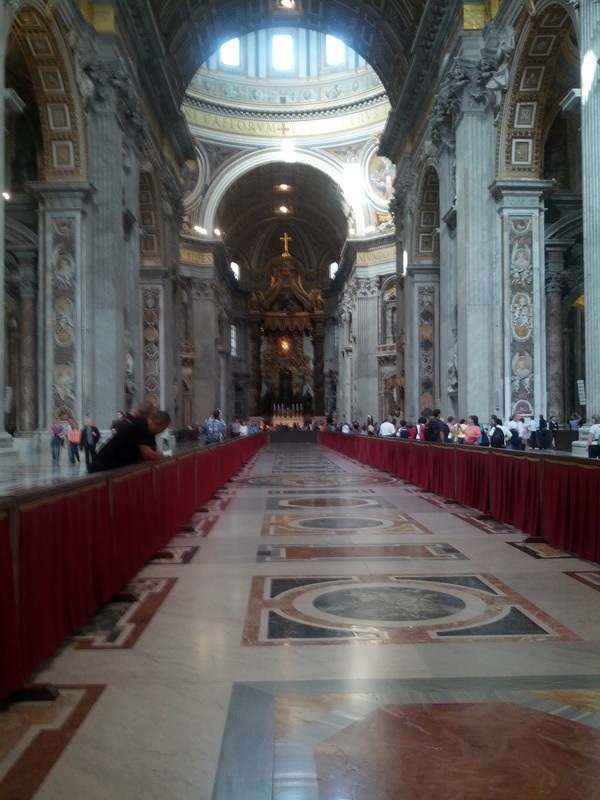 We went the wrong way after the Chapel and ended up sneaking into St. Peter’s Square and the Basilica. Only tour groups are allowed in them unless you wait on the other side of the Vatican in a giant line to be let in. 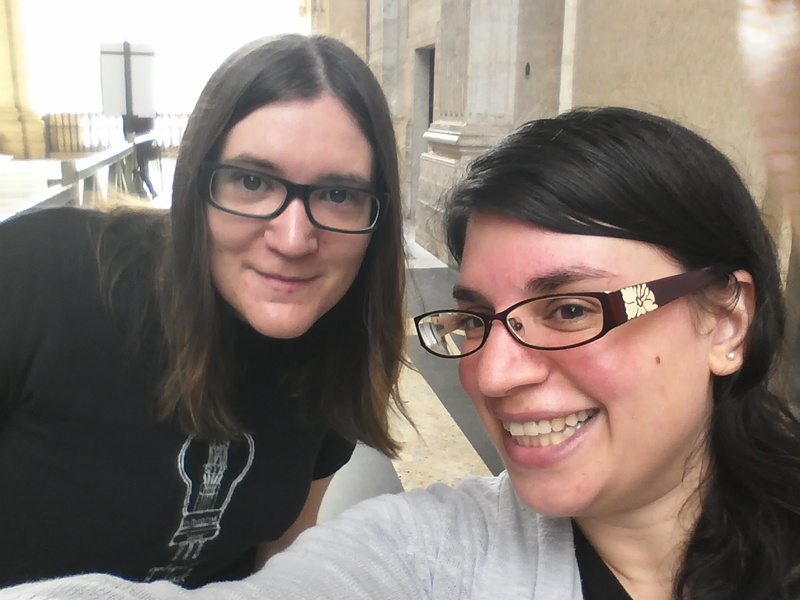 We went to an Italian mass inside St. Peter’s Basilica and ducked out when we realized what was happening. It’s a beautiful church. Afterwards we got incredibly confused about how we were supposed to go back to the entrance to get Alana’s backpack. Don’t bring a backpack to Europe. That’s what we all learned. They will confiscate your backpack to lock it away while letting every other kind of bag imaginable go into the museums and buildings. We forced a security guard to let us back up a set of stairs that explicitly stated we could not traverse upwards on and demanded another security guard let Alana go back to get her back pack. There are no signs to explain how to get back to the entrance without having to go around the entire Vatican on the outside wall. This security guard took pity on us when we lied and said she needed her pills. However by the time she got back to where we were a new guard had appeared and he didn’t want to let her back in. We had to show him pictures of her inside the Vatican to prove she wasn’t trying to sneak in. All we wanted was to be allowed to leave Vatican City, but once you’re in, you are in. Finally we convinced the guy and walked back around to where he told us the exit was. Hilariously we ended up walking right by where they had stored her bag. Yes, they transport the bag you store with them to another part of the Vatican and don’t tell you that’s what’s going to happen with it. We finally managed to get out, after about 5 hours of being there, and took the metro back to central Rome. That night we looked up a place to eat, we got there around 9 pm but it was full so we booked a reservation for the Saturday we would get back to Rome and walked down the street. There was a cash only place and Alana had to break a 100 euro bill so we went there. It was called Taverna Romana. It was fantastic. Alana and I both had the carbonara. I love carbonara. But this was so good. The meat and cheese in Italy is vastly superior to our meat and cheese. It tasted like eating candied prosciutto bits. Their pasta was so fresh. Dave had veal sausage wrapped in mortadella. We don’t have pictures because we scarfed our food so fast. Would LOVE to eat here again. My advice about eating in Italy, and I suppose any country you’re unfamiliar with, is, bookmark all the restaurants you want to eat at, locate a grocery store and a 99 cent store right away and always make sure you know whether there is a sitting fee at the places you’re eating, sometimes it’s significantly cheaper to stand up and eat a croissant. Breakfast is the fastest meal of the day it Italy, often just a pastry (a freaking delicious nutella filled one) and a coffee so don’t bother to sit down to eat it. Have it at the counter and go about your day. If you need to book a restaurant reservations for ones that look like they’ll fill up do it before you go. You might not know exactly when you’re going to eat but to give you an idea we ate dinner normally past 8:30 pm. We walked around Rome a lot during the 3 days we spent there. The weather was great, October is a perfect month to travel in Italy. Their metro is lacking because they’ve only been able to build 2 short lines. Every time they try and build a C line they run into more historical sites that need to be excavated, so expect to walk a lot. I can’t describe all the things we saw, ate or experienced. They say Rome wasn’t built in a day but you sure can see a lot of it if you’re willing to walk 30,000 steps/11 miles every day you’re there. Part 2 tomorrow: Florence. Ugh, I miss you Florence.